For many significant events in history, that facts seem to get tweaked and changed over time, mostly accidently, at the discretion of the person that is writing about the subject matter. Humans also like to state their own opinions which can quite often come from their own conclusions as opposed to being 100% factual. 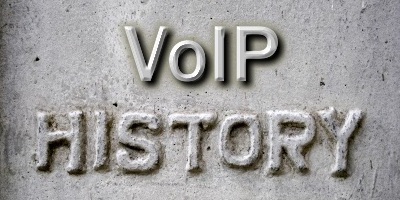 The history of VoIP is likely no different and as time passes, and people copy content from across the web, it becomes more and more difficult to determine what is fact and what is fiction. On this page, we are going to state as many facts as possible and will leave it up to the rest of the world to add comments and fill in any potential gaps that we may have missed. So we certainly welcome any comments on this subject and truly appreciate them. Our original history of VoIP document was created back in 2005 and no longer added much unique value as it had been copied countless times by unethical people and posted on their own websites. As such, this is our attempt at an improved version of the keys events in the VoIP history. 1973 to 1994 - A number of people and companies worked on networking protocols that eventually contributed to the creation of VoIP as we know it today. 1995 - The first Internet phone software is made available by a company called VocalTek. This software was designed to operate as a home phone but back in 1995, the Internet was in its infancy and broadband speeds to the home were typically dial-up connections and did not have the capability to make an Internet phone for the home a viable product. The software also used modems which added to the poor user experience and terrible voice quality. 1995 - Intel and Radvision begin working on the VoIP standards that specific focused around compatibility between the Intel H.323 video-conferencing solution and the Radvision H.323 video-conferencing solution. 1996 - ITU begins working on the H.323 standard. 1999 - The Session Initiation Protocol (SIP) , RFC2543 is released and becomes a key catalyst in the explosion of VoIP products and services over the coming years. 2000 to Present - Entrepreneurs jump on the VoIP bandwagon and start building companies that offer residential and business services and much lower prices than analog based Plain Old Telephone Services (POTS). Solutions that are based in the cloud become extremely popular with smaller businesses as they not only offer significant cost savings, but also bring enterprise level features along with ease of use and no on-premise equipment requirement. Larger businesses start switching to on-premise IP PBX solutions that offer huge benefits in costs, features and productivity. A recent 2013 report from IBISWorld indicates that the VoIP market is now worth $15bn with annual growth from 2007 through 2012 of 16.7%. Our own research recently broke this data down into Country specific growth rates for 2014, which may be of interest to our readers. Broadband speeds - both consumers and businesses have become faster and the majority of homes in the USA and Canada now have a high speed Internet connection. This is a key requirement for VoIP so removes a major hurdle that previously stood in the path of adoption growth. Quality of Service (QoS) - internal company networks are now easily provisioned for QoS and can prioritize voice traffic over data traffic and as such avoid sound quality issues that plagued VoIP in the early days of this technology. Competition - there are many companies that now offer VoIP service and this has created somewhat of a price war that has driven prices down to levels that make it impossible to ignore VoIP as a solution for home or business phone service. The downside of so many companies to choose from is that it has created a lot of confusion and indecision as people and businesses try to compare different options and find the best solution. It is for this reason that WhichVoIP.com exists, to help our visitors find the best service based on their needs. Security concerns - when any device is connected to the Internet, security becomes a concern as there is a the potential for viruses to enter your network via Internet calling technologies. Firewall software and protocols such as SRTP (Secure Real-time Transfer Protocol), ZRTP, NAT (Network Address Translation), IPSEC and encryption now help in preventing any type of hacker attack on your network or systems. Benefits of VoIP - low cost, low maintenance, enterprise level feature sets, improved productivity, ease of use are just some of the reasons why it is hard to justify not using VoIP. Video over IP - Solutions that offer not only voice but also video are becoming more widely available and it is now easy to make a free video call using some services such as Skype and most instant messenger services. For further information and a detailed explanation on VoIP and how it works you can visit our VoIP Explained page. For more information on the features available through a VoIP phone service you can visit our guide to VoIP Features page. Our home user review section features over 100 providers and thousands of reviews. Although the history of VoIP is of course not only important and interesting, it is the overall impact that it has had on telecommunications that makes it significant in our everyday lives, and will continue to do so for a long time to come. #1 : Posted by Tom P.
Good info. I remember the early days of VoIP, wow the quality was bad! Now everyone uses it, and probably without knowing. Comcast's phone service is VoIP based! -> Response: We remember those days well too Tom :-) Comcast do a great marketing job, they never even mention the name VoIP these days.